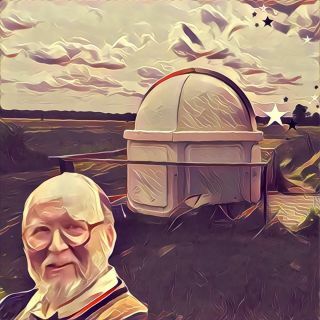 Digital portrait of Geoff Gaherty at Foxmead Observatory in Coldwater, Ontario. Geoff made over 700 observations of deep-sky objects. We are deeply saddened to inform our readers that longtime Night Sky columnist Geoff Gaherty died on July 7, 2016, from complications following a kidney transplant. For many years Geoff has been a weekly fixture to his readers on Space.com and beyond, teaching us how to observe the rich tapestry of the night sky with all its wondrous objects and intricate motions. Geoff touched the lives of many in the amateur astronomy community and it deeply saddens us to know that he is no longer with us. He was uniquely generous, committed and talented — a man with a passion for astronomy and the extraordinary ability for communicating it with others. Geoff had many interests, including music and nature conservancy, but amateur astronomy had a special place in his heart. The word "amateur" comes from the Latin "amare," which means "to love." An amateur is first and foremost someone who does something because he or she enjoys it. Noted author Terence Dickinson describes an amateur astronomer as a "naturalist of the night." That is to say, amateur astronomers are to professional astronomers what birdwatchers are to ornithologists. Like birdwatchers, amateur astronomers spend a lot of time outdoors, often in uncomfortable conditions, trying to spot something that is often only of interest to fellow enthusiasts. Geoff believed that anyone could be passionate about the night sky. They might just need someone to provide them with the spark to ignite that passion. With his weekly column, Geoff always tried to provide that spark for newcomers and sustain the interest of those who were already naturalists of the night. "It was the appearance of a bright comet, Arend-Roland, in 1957 that first piqued my interest in astronomy, even though I never saw it…but I became interested in a bright object high in my southern sky. With the help of a book (no software back then — no desktop computers in fact) I identified this object as the planet Jupiter. Soon I was looking at telescope ads, and ordered a 'Palomar Jr.' 4.25-inch reflector from Edmund Scientific. The telescope was delivered on July 4. I put it together and, as dusk fell, pointed it first at the moon and then at Saturn. Saturn was simply unbelievable: 'It really has rings!' I said to myself … I was hooked on astronomy. A few months later, I made an independent discovery of another bright comet, Mrkos. Spotting Mrkos hanging in the northern sky above our cottage in the Laurentians is one of my all-time most vivid astronomical recollections." Geoff became interested in astronomy at a very pivotal moment in space science and exploration. Sputnik launched that same year in the fall. Soon, a Russian flew into space and not long after so did an American. The whole space race of the 1960s was a heyday for astronomy and he had a lot of enthusiasm for the subject. He joined the Montreal Centre of the Royal Astronomical Society of Canada (RASC) and started to learn more and more about his newfound passion. He became a skilled planetary observer, made many sketches of Venus and Jupiter, served as national coordinator for the society's planetary observing program in the early 1960s and recorded hundreds of variable star observations for the American Association of Variable Star Observers. Geoff's stories from those days tell of a different kind of hobby than one might imagine today. Amateur astronomers attended formal meetings and bought expensive telescopes; astronomy was "work" back then and there was a real focus on making a real scientific contribution with your observations. There was also a lot of fellowship. One of his fellow travelers from the Montreal Centre was the well-known comet hunter and writer David Levy, who still remembers Geoff to this day. Geoff went on to graduate with a B.S. in mathematics and physics from McGill University in 1964 and then moved to Toronto, where he received a Ph.D. in anthropology from the University of Toronto in 1970. This period also marked a long hiatus from amateur astronomy. Five musical "stars" in the northern sky. Geoff was the founding member and anchor of the early music quintet aptly named Cassiopeia. Geoff played a number of instruments including the lute and recorder. Fast-forward 34 years, spent getting educated, married, divorced and remarried — little time for astronomy! Geoff was spending his university's "March Break" in New York City in 1997 with his wife, Louise, and son, David, when he looked out of his hotel window on 57th Street early one morning and was amazed to see a bright comet hanging above the skyscrapers to his north. This was Comet Hale-Bopp — one of the most spectacular comets of the 20th century — and once again a comet lured him into amateur astronomy. He started reading magazines, and then got the telescope out of the closet. Shortly after, he rejoined the RASC, this time with the Toronto Centre, and became an active observer again. One of Geoff's mantras during his "second coming" to astronomy was that it had to be "fun." He had no interest in the administration and operations of his astronomy club. Instead, he just went ahead and did things that he liked to do, things he wanted to do, and in so doing made richer, larger and longer-lasting contributions to his club and the wider astronomy community. Later in life, Geoff become a prolific writer, astronomy communicator and mentor to many. Locally, he presented "The Sky this Month" at his regular astronomy club meetings for more than five years. For the Royal Astronomical Society of Canada's Journal, he wrote a column called "Through the Eyepiece," for which he won the Ostrander-Ramsay Award for Astronomical Writing. Most recently, Geoff penned the text portion of "The Sky Month by Month" for the RASC's venerable "Observer's Handbook." Since the early 2000s, he was an active participant in many astronomy forums and email groups, where he helped countless people with their astronomy, observing and equipment questions. He moderated two of the most popular astronomy forums on Yahoo Groups — Talking Telescopes and Starry Nights. He loved trying out different astronomy equipment — he owned more than 25 telescopes since his youth — and many of his authoritative reviews of telescopes ended up in various publications. His weekly column on Space.com in partnership with Starry Night software enabled him to reach millions of readers on a regular basis. In addition to maintaining his own blog and social media outlets, Geoff also traveled to numerous astronomy clubs to deliver talks. The internet is sprinkled with his knowledge and wisdom in the form of forum postings, articles, blog posts, e-books and observing guides. He embodied a lifelong commitment to share his knowledge and passion with as many people as he could. Geoff Gaherty (on left) receiving 2008 Chant Medal from. RASC President Dave Lane. Earning the society's Messier certificate (fourth person to do so in Canada). Earning the society's Finest NGC certificate in March 2001. Earning the challenging Herschel 400 certificate in 2006 (48 years after he began observing the 400 required Herschel objects). Making more than 1,500 variable star observations for the American Association of Variable Star Observers. Regularly observing Jupiter and its rotation for the Association of Lunar and Planetary Observers. "This is an in-joke in my astronomy club, the RASC Toronto Centre. A few years ago I did a presentation on telescopes and binoculars, and I mentioned that any purchase of new equipment inevitably leads to cloudy skies commensurate with the cost of the purchase. Unfortunately, this truth has become permanently associated with my name. "I also did a presentation called 'The Sky This Month' at our monthly meetings for about five years. It became a corollary to Gaherty's Law that any event I described would be clouded out. Finally, in desperation I declared during my presentation that absolutely nothing was going to happen this month!" Montreal Centre "old timers" of the 1950s and 1960s, with Montreal Centre president Bill Strople. Geoff Gaherty, Bill Strople, Constantine Papacosmas, Jim Low, David Levy. One of Geoff's good friends, Tom Luton, responded to Geoff's passing with the well-known poem "The Old Astronomer," by Sarah Williams. The poem is written from the perspective of an old astronomer on his deathbed speaking to a beloved student. "The problem of darkness does not exist for the man gazing at the stars. No doubt the darkness is there, fundamental, pervasive, and unconquerable except at the pinpoints where the stars twinkle; but the problem is not why there is such darkness, but what is the light that breaks through it so remarkably; and granting this light, why we have eyes to see it and hearts to be gladdened by it." Good night, Geoff, and farewell. Your light broke into our hearts. We will think of you often whenever we see a starry night.